Andrena “Nikki” Pappas, 91, of Overland Park, Kansas passed away on November 1, 2018. Funeral services will be at 10:30 o’clock a.m. on Tuesday, November 6, 2018 at St. Dionysios Greek Orthodox Church, 8100 W. 95th St., Overland Park, Kansas 66212. Visitation will be 6 pm to 7:30 pm on Monday, November 5, 2018 at St. Dionysios Greek Orthodox Church, 8100 W. 95th St., Overland Park, Kansas 66212. Burial in Maple Hill Cemetery, Kansas City, Kansas. Nikki was born September 14, 1927 in Kansas City, Kansas, and spent nearly her entire life in the Kansas City area. She married William J. Pappas on June 24, 1951. She was married to Bill for 56 years before his death in 2007. 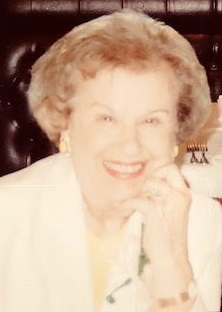 She graduated from Argentine High School in 1945 with honors and was a member of the National Honor Society. After being a stay at home mother for 19 years, she returned to work at the Marley Cooling Tower Company, retiring in 1990. Nikki was actively involved in the Greek Orthodox Church for her entire life. She had a love of cooking, dancing and entertaining. She was instrumental in bringing the annual Greek festival to Kansas City, which has been a Kansas City tradition for many years. Nikki is survived by her children, Pamela Farha (Charles) and Gregory Pappas (Sharon), and her granddaughter Kristin Boos (Jason), along with her many nieces, nephews and cousins. Nikki was a loving wife, mother, sister, and grandmother, and was especially devoted to her granddaughter Kristin, who held a special place in her heart. She lifted our spirits and her cheerfulness was an example to all of us. Memorial contributions may be made to Annunciation Greek Orthodox Church, 12001 Wornall Road, Kansas City, Missouri 64145, or St. Dionysios Greek Orthodox Church, 8100 W. 95th St., Overland Park, Kansas 66212. Funeral services will be at 10:30 o’clock a.m. on Tuesday, November 6, 2018 at St. Dionysios Greek Orthodox Church, 8100 W. 95th St., Overland Park, Kansas 66212. Visitation will be 6 pm to 7:30 pm on Monday, November 5, 2018 at St. Dionysios Greek Orthodox Church, 8100 W. 95th St., Overland Park, Kansas 66212. Burial in Maple Hill Cemetery, Kansas City, Kansas.